Through the use of innovative design processes, Stellar has improved numerous items on the cable hoist. With the use of advanced design software, Stellar has decreased the shipping weight of the Cable75* to 4,400-pounds, which in turn increases the payload by up to 1,700 additional pounds. Another feature of the Cable75 is the cable routing now spins in a single direction of rotation only, eliminating switching directions when winching in and out, which can cause unnecessary wear on the cable. The design of the Cable75 now includes only a single reeving cylinder that is always covered by a structural enclosure, decreasing its exposure to damaging debris. Having only one cylinder decreases the amount of maintenance required with less seal kits to maintain. The sheave bushings and pins are stainless steel, and bushings and grease zerks are installed in both rod-end pin bosses to improve operation and maintenance. High strength wear strips have been added to the mainframe, and ½” high strength wear plates were added to the end of the mainframe tubes to increase strength and durability. Stellar has incorporated the use of a hydraulic piston pump on the Cable75. Piston pumps are more efficient, have a longer life, and handle higher operating pressure and pressure spikes better than gear pumps. Using a piston pump has also decreased the gpm (gallon per minute) requirements due to operating at a higher pressure, therefore decreasing the size of the hydraulic oil reservoir from 60-gallons down to 25-gallons. This also contributes to a greater payload capacity. Lift cylinders . . . . . . . . . . . . . . . . . . . . . . . . . . . . . . . . .5” x 71” D.A. Reeving cylinder . . . . . . . . . . . . . . . . . . . . . . . . . . . . .6.5” x 80” D.A. 1. 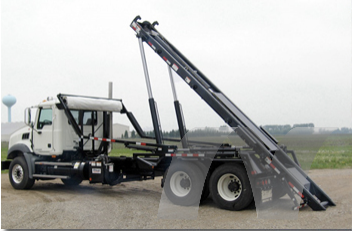 Thoroughly check the truck requirements to ensure proper clearance and frame strength before mounting the hoist. Note: The rear cab boundary is the rearmost unremovable protrusion behind the cab and above the chassis frame. means 1,700 lbs more payload capacity and less hauling costs per year. capacity is approximately 3,600 psi. Cable 7/8” cable diameter (6×37 EXIWRC) is standard. No need to upgrade to 1” cable if setting hoist for 75,000 lb lift capacity. from clockwise, to counter clockwise, then back to clockwise. The Cable75 cable runs only in one direction. greaseless. Bushings and grease zerks are installed in both rod-end pin bosses. Reeving cylinder enclosure Reeving cylinder rod is always covered by structural enclosure, which decreases the potential to expose the cylinder to damaging debris. Hydraulic piston pump Piston pumps are more efficient, have longer life, handle higher operating pressure and pressure spikes better than gear pumps. contributes to a greater payload capacity. Stainless steel pins Stainless steel pins are used in rear hinge, sheaves, and cylinders. Bushings and grease zerks Bushings and grease zerks at installed at all pivot points. Finish paint Two part polyurethane automotive finish paint. Dump cylinder mounting This new design doubles the shear strength and makes for easier pin removal. Wear strips High strength wear strips added to main frame. Main frame end plates 1/2” high strength wear plates added to end of main frame tubes. Warranty 36 months structural, 12 months parts and labor.